Contacts play a crucial role for any individual on their iPhone. Deleting any one of the contacts by mistake is the scariest thing happening. The reason behind losing contact is mainly due to accidental deletion or during synchronizing with the computer. As long as you possess a recent backup, you do not have to worry about losing the contacts. Nonetheless, if you do not have a backup, then things could go the other way. 1 If you have found out about losing a few contacts, then the first step is to check whether you have created a backup of the iPhone using iTunes or iCloud. If you did take a backup, then you can easily restore the contacts using the particular backup file. 2 If you did not create any backup before losing the contacts, then ensure that you did not extensively use your iPhone for anything else. If you have used your iPhone, then any new operation will overwrite the content, which makes it impossible to recover. 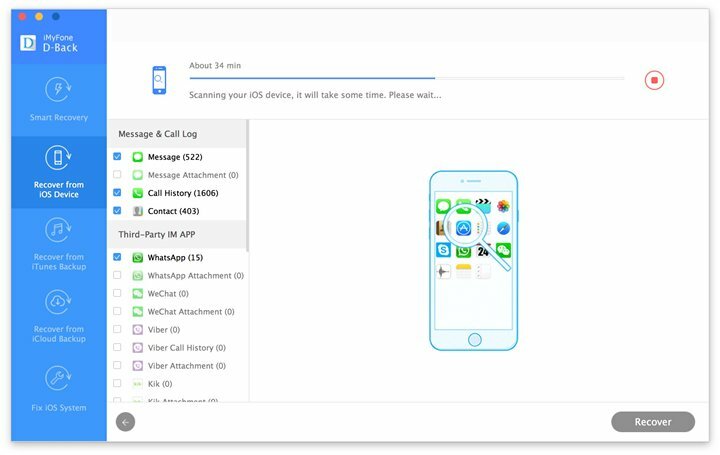 Continue to study ahead as we present you with useful information about recovering deleted contacts from your iPhone using iPhone data recovery tool. 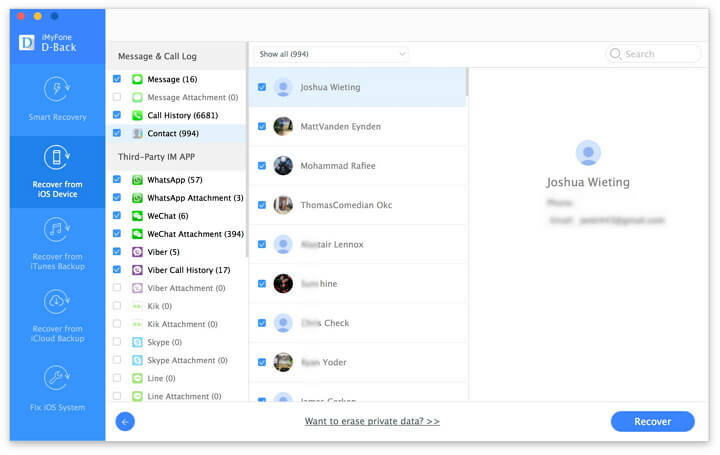 Identifies over 22 different file formats including contacts, text messages, photos, voice memos, notes, third-party instant messenger apps and more. 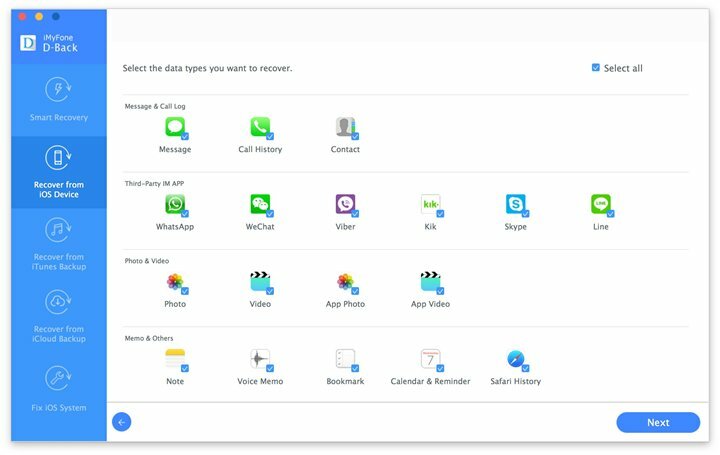 Uses four different recovery methods to find the lost data quickly and efficiently, which are smart recovery, recover from iOS device, recover from iTunes backup, recover from iCloud backup. Has the preview functionality to display the contents of a file before recovering. Helps in fixing the iOS system without restoring the device or losing any data. 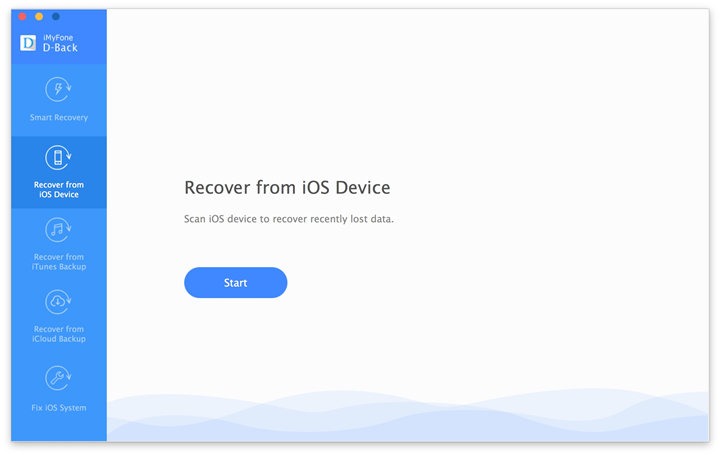 Assuming that you have created a backup of your device recently, we will consider the recovery of the deleted contacts using the “Recover from iOS device” option. Note: If you did take a recent backup, you can then choose either "Recover from iTunes Backup" or "Recover from iCloud Backup" options. Step 1: Visit the iMyfone D-Back official website to download the trial version of the software onto your computer. Install the program by going through the instructions displayed on the screen. After completion, launch the program by double-clicking the icon appearing on the desktop. From the main screen of the software, choose "Recover from iOS Device" option. Step 2: Hit the Start button to proceed to the selection window, where you will be selecting the file format for recovery. Here, choose "Contact" as the option and press the Next button at the bottom. Step 3: The program will prompt you to connect your iPhone to the computer. Make the necessary arrangements. Once done, iMyfone D-Back will detect the device automatically and will display the screen as shown below. Step 4: Press the Scan button to commence the scanning of the device. After completion, iMyfone D-Back will show the recoverable contacts in its preview window. You can then select individually the displayed contacts to see the information contained in it. You can also select "Show Only the Deleted Files" option to see only the deleted contacts. Mark the contacts that you wish to recover, and click the "Recover" button. Step 5: iMyfone D-Back iPhone data recovery Win or iPhone data recovery Mac will open a small window asking you to select the destination on your computer to save the selected contacts. You can press the Browse button from the window and navigate to a destination on your computer hard disk. It requires only a few minutes to complete the process. Wait for the program to finish the action before you browse the folder.